The exhibition focusesed on the 2014 Bus Party group and their efforts through music, poetry and readings to discuss peoples’ hopes for Scotland’s future regardless of the referendum outcome. 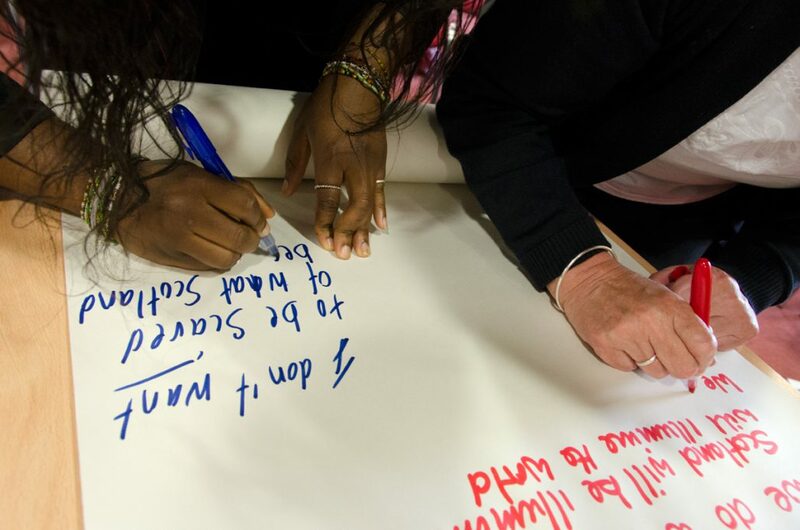 The Bus Party travelled around Scotland during the last week of May 2014 asking communities ‘What kind of Scotland do you want?’ Their answers were recorded on the Scroll of Thoughts. This exhibition showcased the archive collections of the Bus Party which were donated to the Scottish Political Archive (SPA). The tour brought the exhibition back to the communities who participated in the 2014 Bus Party and helped to create the Bus Party Collection which is held at the University.